Chausson was the kind of book-collector with the means to possess a copy of Les Fleurs du mal by Charles Baudelaire in the first edition of 1857. The poem L’albatros stands near the beginning of that great work, the second of the section entitled Spleen et Idéal. Chausson might have known Duparc’s L’invitation au voyage at this early stage of his career (La vie antérieure, Duparc’s other great Baudelaire setting had not yet been written) and he might have been spurred to set this poet by Faure’s publication of his two Baudelaire settings, La rançon and Chant d’automne, which appeared in 1879. This is a grotesquely pessimistic text for a young composer. It talks of clumsiness and handicap and ugliness (although Chausson excises the poem’s third strophe where the albatross is tortured by the sailors) and one senses that Chausson, even at the tender age of 24, before he has suffered any actual musical setbacks, identifies all too easily with Baudelaire’s agonised analogy of the artist in society. Of course the song is a failure, as most settings of this poet are doomed to be, but at least it is an honourable one. The sombre tonality of the original key of E flat minor is awkwardly written in an ineffective tessitura. The wide-ranging arpeggios of the accompaniment suggest a large bird in flight, and there is a certain liquidity in the vocal melody—not exactly a memorable tune—which glides effectively from one key to another as if restlessly seeking a place to land. As long as the song deals with sea and bird pictures Chausson, awash with chromatic idées reçues, manages somehow. The real failure of the piece is the last verse where the poet draws his moral. At ‘Le Poète est semblable au prince des nuées’ the accompaniment switches in to high-flown triplets which underpin a march-like melody in a mode of sublime triumphalism. 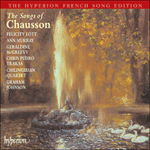 One understands that Chausson is aiming for something prince-like and regal, but this music is puffed u p and platitudinous, the fate of most song composers when they attempt to make a philosophical point. The interest of the setting is that it shows us that between May 1879 (when Le rideau de ma voisine had been written) and October of the same year (when he grappled with L’albatros) Chausson had decided to ditch Massenet as a teacher: the song carries the signs, for better and worse, of the recent convert to César Franck and that composer’s ‘sublime’ style. The ship as it glides through briny depths. Trail piteously beside them like oars. His giant’s wings prevent him from walking.